Home Feline Foster kitties Eva and her sisters. 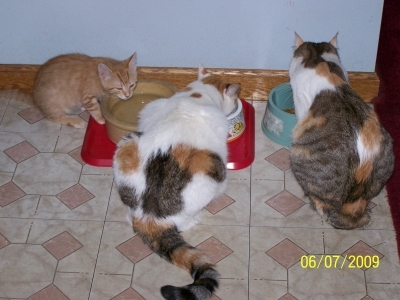 Eva, Unique and Tira. They get along with each other quite well. Eva has her own dish in her crate, with kitten food, she still goes to the “big kitty” dishes, and they will let her push them away from their food! It’s obvious that Eva is growing, but she still seems so small next to the other two. Eva and Tira play quite a lot, with all the accompanying “someone is getting KILLED! !” noise, sometimes Eva plays with Unique, and sometimes all 3 thunder around the house like a herd of elephants.